Stillingtagen, ansvar og modstand mod udsendelse af irakere! Vi, elever fra Det Fynske Kunstakademi, samarbejdede med Odense Lufthavn i forbindelse med vores afgangsudstilling i 2007, med titlen “This could be the beginning of a beautiful friendship”. Vi skriver i forbindelse med at 22 irakere natten til onsdag d 2. september 2009 blev sendt ud af Danmark fra Odense Lufthavn. Vi er dybt berørt over hele situationen. Vi var i 2007 meget glade for vores samarbejde med Odense Lufthavn i 2007 og trykte i den forbindelse et katalog, der er sendt ud i Danmark og mange steder i verden. Her indgår samarbejdet tydeligt og på katalogets forside er et billede af Odense lufthavn. Som det fremgår af udstillingens titel “This could be the beginning of a beautiful friendship” handlede vores udstilling om, hvorvidt venskab på trods af forskellighed, baggrund og kultur kan finde sted. Flere af værkerne på udstillingen handlede netop om krigen i Irak og de flygtninge, der nu er i klemme både i Danmark og i Irak, ydermere skrev Mikkel Bolt, lektor på KBH universitet i vores katalog om den hastigt voksende racisme og intolerance der breder sig i Danmark. Da vi vågnede onsdag morgen med nyheden om, at 22 irakere var sendt ud af landet fra Odense Lufthavn, fik vi en meget mærkelig fornemmelse, følelsen af at mængder af spildt energi, initiativ og troen på, at fredelige ytringer og dialog på nogen måde har en virkning, synes håbløse lige nu. Deltagelse i hjemsendelsen af irakere, der har ventet og håbet i op til 10 år og det at tvinge dem til at efterlade deres børn her, ser vi som en fravigelse fra individuelt ansvar og medmenneskelighed. Vi afholdt vores afgangsudstilling på det sted, hvor det har foregået, og vil hermed kraftigt markere at vi ikke bakker op om så kynisk og umenneskelig handling. Afgangselever fra Det Fynske Kunstakademi 2007. Tekst til billeder: Installationsfoto taget af Brian Enevoldsen. Af værk der indgik på afgangsudstillingen fra Det Fynske Kunstkademi 2007. Tegnede protrætter af civile irakere fra fotos hentet på internettet og placeret i bunkeren tilstødende til Odense Lufthavn, af Anne Bennike. Forfatter hamletUdgivet 04/09/2009 04/09/2009 Kategorier Arrangementer, Blandet, OpråbSkriv kommentar til Stillingtagen, ansvar og modstand mod udsendelse af irakere! Irrutions of the real: Video screening by Jalal Toufic followed by talk. 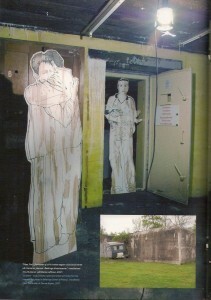 Still fra videoen: Saving Face, video, 8 minutes, 2003, af Jalal Toufic. 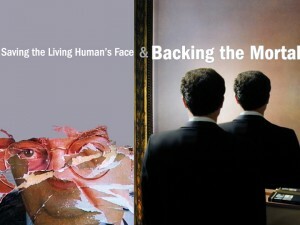 Saving Face, video, 8 minutes, 2003. Were all the candidates’ faces posted on the walls of Lebanon during the parliamentary campaign of 2000 waiting for the results of the elections? No. As faces, they were waiting to be saved. 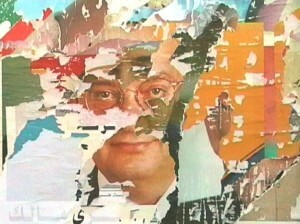 Far better than any surgical face-lift or digital retouching, it was the physical removal of part of the poster of the face of one candidate so that the face of another candidate would partially appear under it; as well as the accretions of posters and photographs over each other that produced the most effective face-lift, and that proved a successful face-saver for all concerned. We have in these resultant recombinant posters one of the sites where Lebanese culture in specific, and Arabic culture in general, mired in an organic view of the body, in an organic body, exposes itself to inorganic bodies. The Sleep of Reason: This Blood Spilled in My Veins, video, 32 minutes, 2002. The organic dying of a (resurrectable) human is as nothing compared to that of an animal, exemplarily of a bull in a corrida; the only phenomenon that equals in intensity the death of a bull in a corrida or of a cow in a slaughterhouse is the resurrection of a human, Lazarus coming out from the grave. The living woman in T. S. Eliot’s The Love Song of J. Alfred Prufrock is found settling her pillow to sleep when she encounters the undead. Why are you settling the pillow, why are you so sleepy? What disclosure are you thus trying to elude? “Tell you all,” Lazarus says in Eliot’s poem, and would that “all” not also include himself? Did Lazarus come back to tell himself about death? And did he find himself sleeping then? Mother and Son; or, That Obscure Object of Desire (Scenes from an Anamorphic Double Feature), video, 41 minutes, 2006. My experience of collaborating in an untimely manner with Gus Van Sant was not a happy one. Had he heeded my suggestions, he would not have tried to do a remake of Hitchcock’s Psycho (1960) in which he reproduced each frame of the original largely in the manner of Hitchcock, but would instead have done a Psycho in the manner of Sokurov, so that the resultant film would have been: Psycho, School of Sokurov (as The Betrothal, circa 1640-50, is by the School of Rembrandt). Such a programmatic film would have proved all the more appropriate when Sokurov went on to do a seemingly programmatic cinematic work, Russian Arc (2002), a 96-minute film videotaped in one continuous shot. Since Van Sant did not heed my suggestions for his remake of Psycho (1998), I did Mother and Son; or, That Obscure Object of Desire (Scenes from an Anamorphic Double Feature), 2006, in lieu of the failed untimely collaboration. Forfatter hamletUdgivet 14/08/2009 14/08/2009 Kategorier Arrangementer, BlandetSkriv kommentar til Irrutions of the real: Video screening by Jalal Toufic followed by talk. that coordination in the mirror image. The anticipated motrice control includes—it is disappointing it doesn’t in Lacan—the ability to turn around to answer a call. To see one’s mirror-image facing one presupposes not only the standard Lacanian imaginary identification with the unitary mirror image, but also the Althusserian symbolic turn to answer an interpellation. It is therefore possible that what the child facing the mirror sees prior to what Lacan termed the mirror stage is what the figure facing the mirror in Magritte’s Reproduction Prohibited, 1937, witnesses: a similar figure but with its back to him. Since the mirror image’s facing a human is not natural, but something that has been conquered, it may fail to take place: a condition actually encountered in psychosis or undeath. “Morning overtook Shahrazâd, and she lapsed into silence… The king thought to himself, ‘I will spare her until I hear the rest of the story; then I will have her put to death the next day.’” Borges errs when he writes: “Why were there first a thousand [the apparently Persian version: Hazar Afsana, the thousand tales] and later a thousand and one?” It is confounding that despite all his flair Borges should miss the displacement from tale in the Persian version to night in the Arabic one: I consider that the first title refers to the stories Shahrazâd tells, while the second refers to the nights, the one thousand nights of the one thousand unjustly murdered previous one-night wives of King Shahrayâr plus his night with Shahrazâd, a night that is itself like a thousand nights. Who is presently visiting Copenhagen! The Dancer´s Two Bodies: (Danserens To Kroppe): Vi vil kigge på forholdet for dansen, hvilket forbinder direkte hvad én som ikke danser ville opfatte og opleve som ikke-tilgrænsende rum-tider, til film, dette medie af pludselig “forandring af sted og fokus” (Walter Benjamin); danseres fastfrysning, hvilket, som det genetiske element af bevægelse, er en tilstand af mulighed for alle slags ekstraordinære bevægelser (baglæns i tid bevægelse, slow motion…); fraktions dimensionerne af det, af dans, forandrede rum med dets flade, ofte malede baggrunde og dens zoner af rumlig ikke-eksistens; rumskabelse af danseren. While watching a great dance film, I witnessed a dancer enter a painting. Taking into account that human bodies cannot do this, was that movement metaphorical or symbolic or oneiric? It was none of these. It struck me as a fact, an aesthetic fact. Consequently, since it happened and since normal human bodies cannot enter paintings, the question becomes: what kind of body is produced by dance and can do what I just witnessed, enter a painting? It is a subtle body with different characteristics than the physical one. In one sort of “dance,” the dancer remains in the homogenous space and time where his or her physical body is—I consider this sort a form of theater or performance rather than dance. But another kind of dance projects a subtle dancer into a realm of altered movement, body, space and time specific to it. We will study the relation of dance, which connects directly what someone who is not dancing would consider and experience as non-contiguous space-times, to cinema, this medium of sudden “changes of place and focus” (Walter Benjamin); the freezing of dancers, which, as the genetic element of movement, is a condition of possibility for all sorts of extraordinary movements (backward in time motion, slow motion …); the fractional dimensions of the altered space of dance with its flat, often painted backdrops and its zones of spatial inexistence; and space-creation by the dancer. — John Cage, Silence. Middletown, CT: Wesleyan University Press, 1961. — Gilles Deleuze, Cinema 2: The Time-Image, trans. Hugh Tomlinson and Robert Galeta (Minneapolis: University of Minnesota Press, 1986), 60-64. — Heinrich von Kleist, “On the Marionette Theatre,” trans. Thomas G. Neumiller, The Drama Review: TDR 16, no. 3 (September 1972): 22-26. — Jalal Toufic, Forthcoming (Berkeley, CA: Atelos, 2000), 194-209. — Stanley Donen & Gene Kelly, Singin’ in the Rain (1952). — Vincente Minnelli, An American in Paris (1951); The Band Wagon (1953); excerpts from Yolanda and the Thief (1945). — Excerpts from Charles Walters, Easter Parade (1948); The Belle of New York (1952). — Maya Deren, Meshes of the Afternoon (1943); At Land (1944); A Study in Choreography for Camera (1945); Ritual in Transfigured Time (1946). — Elliot Caplan/Merce Cunnigham, Points in Space (1986). — Michael Powell and Emeric Pressburger, The Red Shoes (1948); “Olympia” from The Tales of Hoffmann (1951). — Carlos Saura’s Blood Wedding (1980); Carmen (1983); Love, the Magician (1986). — David Blair, Giselle, American Ballet Theater (with Carla Fracci and Erik Bruhn), 1969. — Oleg Vinogradov, Coppélia, The Kirov Ballet, 1993. JALAL TOUFIC: tænker og kunstner. Hans arbejde har været vist på steder som: Artists Space, New York; ICA, London; Witte de With, Rotterdam; Fundació Antoni Tàpies, Barcelona; Kunsthalle Fridericianum, Kassel; the Museum of Contemporary Art, Roskilde, Denmark; Nikolaj, Copenhagen Contemporary Art Center; og 16th International Documentary Filmfestival Amsterdam (IDFA) i et “Focus Jalal Toufic” program. Han har holdt foredrag på U-TURN Kvadriennalen i København og undervist på University of California at Berkeley, California Institute of the Arts, USC, DAS ARTS og Rijksakademie i Amsterdam, USEK i Libanon og er i øjeblikket Professor på Kadir Has Universitetet i Istanbul. Tak til: CPH AIR, Overgaden: Institut for Samtidskunst, Anne Bennike og Maria Klarlund.